There’s nothing more frustrating than seeing your kitty suffer from an allergy—and it turns out the food she’s eating is often the culprit. Fortunately, if you know your feline struggles with a food sensitivity, you can usually manage it well by feeding her a hypoallergenic diet. How can you tell if your cat has a food allergy—and if so, what’s the best type of food for her? In this review, we’re going to talk about what cat food allergies are, how to tell if your little furball suffers from one, and which type of food will be the best for her to eat. To help you choose the right product, we’ll also give you some insider tips on the top 4 brands we found in our research—based off price, quality of ingredients, effectiveness, and customer reviews. What Are Cat Food Allergies? Is It Wet or Dry Cat Food? Are There Any Common Ingredients to Avoid? According to some research, a food allergy is the third most common type of allergy seen in cats—topped only by flea bite allergies and inhalant allergies (from airborne particles like pollen and chemicals). A cat food allergy occurs when a specific substance in your feline’s diet stimulates an over-the-top immune system response. When the triggering substance (subsequently called an allergen) gets into your cat’s body, immune cells in her digestive tract produce antibodies. These antibodies signal other immune cells to attack the “threatening” allergen, even if the allergen isn’t particularly harmful or noxious to most other animals. Indeed, your cat may develop an allergy to a substance that never bothered them in the past! Aside from creating a variety of uncomfortable symptoms (which we’ll discuss shortly), a food allergy can also damage your kitty’s intestinal tract, making it “leaky.” Over time, this can lead to a variety of problems, including decreased nutrient absorption and even a weakened immune system! It’s not entirely clear what causes an allergy to develop in the first place, but most cats who end up getting one will develop it between age 2 and 6. They appear to affect male cats and female cats equally, as well as fixed and unfixed animals. Certain breeds may be at a greater risk for developing them, but pretty much any breed can be affected. So, what kinds of food allergens are the culprits? The most common ones include gluten (a protein found in wheat and other grains), corn, dairy, soy, artificial preservatives (including fillers and coloring), and meat by-products. Notice something interesting? Most of these ingredients are found in popular commercial brand cat foods! If your cat has chronic yeast infections or year-round skin problems which seem to respond to medication but come back as soon as the medication runs out, then her issues probably stem from the food she’s eating! Now, you might be wondering what the difference is between a food allergy and a food intolerance (or if there even is a difference). In cats, at least, the main difference is that 1) a food allergy stimulates a specific immune system reactivity, and 2) the main symptoms are generally related to the skin, whereas a food intolerance tends to lead to gastrointestinal issues like nausea, vomiting, and diarrhea. That said, the best cat food for allergies is often good for cats with food intolerances, too, since they’re generally made with higher quality ingredients. So if you notice any of the above signs, it may be worth looking into switching up your pet’s food. So, let’s say your cat does scratch a lot and has itchy irritated skin. She get’s ear infections a lot and snores in her sleep. Sure, it may sound cute—but it could indicate a big problem! Now comes the challenge of figuring out what’s causing her food allergy. Is it dairy? Soy? Gluten? Something else? Sometimes protein in eggs, fish, or even beef can cause a food allergy in cats. Unfortunately, diagnosing a food allergy in cats can be a little tricky. There isn’t really a specific test to help you determine what’s causing it. A lot of it comes down to some trial and error—removing certain foods from her diet and seeing how it affects her. A formal way to do this is called an elimination diet—something your vet can help you do. So, what’s the best cat food for skin allergies that you should replace her current food with? Your best bet is to go for a kind called hypoallergenic. Hypoallergenic cat food has been specifically formulated to be free of common allergens. By default, it’s usually made with very high quality ingredients (like real meat, healthy fats, and low carbohydrates like vegetables and fruits) and free of the low-quality ingredients like fillers and artificial colors. Many types of hypoallergenic or “limited ingredient” foods are also minimally processed, meaning they haven’t been made with a lot of heat or other processes which can affect the food quality. Now, it’s important to realize that one type of hypoallergenic food may work well for one cat—but not for your cat. It really all depends on what your animal’s specific intolerances or allergeies are. That said, the obvious benefit of giving your pet the right type of hypoallergenic cat food for her is that it can reduce or even eliminate her food allergy symptoms. Good hypoallergenic food is also usually nutrient rich and can even restore her gut health, too. And while hypoallergenic food is often more expensive than regular food, most pet owners with sensitive kitties find that the extra price is well worth the investment. Ask your vet about probiotics, essential fatty acids, digestive enzymes, and other supplements which may enhance her overall health. Ask your vet about medications (whether oral or topical)—your kitty may need some to help her irritated skin and other inflamed tissue heal. Make sure you consider the types of treats you’re giving her! Many popular kitty treats are full of the same kind of additives, fillers, and other allergens that pose a lot of problems for kitties. Dried or freeze dried meats and organ meat are usually a good pick. Also, make sure that she gets plenty of water. Cats don’t have a strong thirst drive, since they evolved as carnivores and got most of their hydration from the moisture-rich meat they ate. But kitties need to be well-hydrated to make sure digestive motility (and other physiological processes) go smoothly. So, try putting her water dish away from her food dish (to mirror a cat’s instinct to keep it’s kill away from water sources) and select food that’s free of junk carbs (fortunately, pretty much all hypoallergenic cat foods are). Deciding which is the best hypoallergenic cat food for your animal—and your wallet! 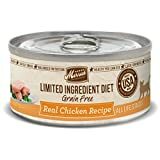 Merrick Limited Ingredient Diet cat food is grain-free and made with real chicken. As a single-source protein product, it’s free of fish (a type of protein that many cats are becoming allergic or intolerant to). This canned food is also free of potatoes and other common preservatives that can be problematic. As an added bonus, this food is also rich in vitamins and healthy omega-3 fatty acids, which are excellent for your kitty’s skin and coat. It’s also free of carageenan, which some research shows is inflammatory. 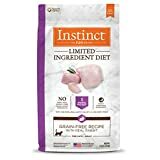 Instinct Original Grain Free Recipe is tasty and delicious—according to cats anyway! The pate style texture is moisture and protein rich, and made with real chicken, turkey, and chicken liver protein…95% of the ingredients, to be exact. The other 5% comes from veggies, fruits, and healthy vitamins and fats. This made in America product is free of grains, potatoes, corn, soy, weat, carrageenan, by-product, artifical colors, and preservatives. Even a few pet owners with older and chronically ill cats have found success with it. Chicken is a great quality meat for all cats, especially kitties with food allergies. 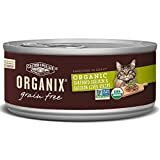 This food—Organix Organic Canned Cat Food—contains free-range organic chicken…something most humans wouldn’t mind eating! It’s high nutrient density is rounded out with real ingredients like organic flaxseed, organic cranberries, and organic coconut flour. 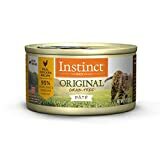 For our final pick, we’ve singled out Instinct Limited Ingredient Diet dry cat food. While dry kibble generally has lower moisture content than canned food, many kitties do well with this style (and canned food can be an easy topper to add on if you have concerns), and it often is more cost-effective. This product contains real rabbit as the protein source, and is free of grains, eggs, chicken, beef, sweet potato, artificial colors, wheat, soy, chickpeas, corn, and preservatives. Kibble is raw coated for an added nutrient boost—and appeal to even picky eaters. You know your kitty is sensitive to something in her food. You’ve gone through your choices and have selected a new product to try, hopeful that it’ll make a difference in her signs. Now, how exactly do you transition her from her old food to her new food? Kitties with food allergies are already sensitive to their diet. But ALL cats do best with a gradual and measured transition from one food to another. After all, doing it too quickly can lead to serious gastrointestinal problems like bloating, gas, vomiting, constipation, and diarrhea…something you’re trying to FIX for her. For about two to four days, mix about 25% of your little girl’s new food in with her old food. For the next two to four days, mix about 50% of her new food in with 50% of her old food. After about three or four days half and half, change the percentage to 75% new food and 25% old food. Finally, you can then switch her to 100% new food. As you’re doing this, pay close attention to how she’s responding to her new diet. If you have any concerns, just give your vet a call. He or she will be able to give you some more guidance on what to do. Once you’ve determined that your kitty has a food allergy, it’s time to go over your purchasing options. Hopefully, the above reviews will help kickstart the process for you! Many cats with food allergies or intolerances are older and/or have failing health. For these creatures, chewing hard kibble can be tough on their teeth and hard to swallow. Additionally, if you give your pet only dry food, she may be at risk for dehydration (since wet food obviously has more moisture in it). And all cats, especially those with intolerances, need to be well-hydrated to ensure their digestive system runs smoothly. Then again, cats can be picky (we love ’em, but it’s true!). Certain textures of canned wet food may be unappealing. Also, you can’t really free-feed with wet food, or at least as easily as you can with dry food—and this may be something your kitty is already used to. For this reason, think about all the individual factors about your kitty when deciding to go wet vs. dry. Many pet owners opt to do both—using a bit of wet food as a treat on top of their kibble. It’s really a matter of pet preference and need. For many kitties, beef, eggs, and fish cause an allergic reaction. So even though your chosen cat food may be considered hypoallergenic, it still may not be well tolerated if it contains any of these protein sources. In general, kitties do well with chicken, turkey, duck—you know, things their ancestors may have caught and ate back in the wild! For the best bang for your buck, you want to find a product that has REAL meat as the main ingredient (e.g., deboned chicken), and ideally only one or two protein sources. Do you see chicken liver on the ingredients list? That’s probably fine, since organ meat is rich in vitamins and minerals. Unfortunately, the vast majority of commercial cat food products are loaded with bad ingredients. As we’ve seen, hypoallergenic brands have been specially formulated to minimize the risk of allergy or intolerance…but sometimes, even “limited ingredient” foods can still contain ingredients which may prove problematic for your little one. Meat by-products: meat by-products are not high quality protein and can be hard to digest. Avoid these at all costs! Dairy: a major allergen for many kitties. Avoid food and treats with cheese, milk, or any other dairy source. Artificial colors, sweeteners, and preservatives: cats can’t even really taste sweetness, so we’re not sure why manufacturers bother trying to sweeten their food! That said, many companies use colors, sweeteners, preservatives in their foods to improve texture and taste, prolong shelf-life, and heck—even cut production costs. But these chemicals can disrupt health and exacerbate allergies, so try to avoid them as much as possible. They include things like sorbitol, sucrose, sugar, corn syrup, propylene glycol, BHA, BHT, TBHQ, ethoxyquin, propyl gallate, benzoic acid, sodium benzoate, potassium benzoate, sodium nitrate, and sodium nitrite. Seafood: as mentioned, fish is often problematic for some cats. One reason is because it can trigger a thiamine deficiency if consumed raw and to access (the symptoms of thiamine deficiency include loss of appetite, seizures, or even death in severe cases!). Fish is also one of the top food allergy triggers for felines (the others being beef and dairy). When looking at the ingredients list, keep in mind that fish oil as well as fish protein may trigger a reaction if your kitty has a seafood allergy. A hypoallergenic cat food may be the best choice for your animal if she has a food allergy or even just a food intolerance. It can relieve or eliminate her uncomfortable symptoms including skin irritation and improve her overall health—and in many cases, you don’t even need to put her on any special medications. In fact, many cat parents prefer to give their pets hypoallergenic food even if they don’t have a specific allergy or intolerance. Why? Because this kind of food is usually nutrient dense and made with better quality ingredients overall. The extra price is well worth it, as far as many pet owners are concerned. At the end of the day, you just want what’s best for your animal—that much is obvious. So start taking a closer look at the ingredients list of your animal’s food…there could be something there that your little feline could do without.